“Šibenik is the most photogenic city in the world“, says Croatia’s most popular photographer, Ivo Pervan. Thus, an ideal way to spend a short break in Šibenik is to take a stroll through the streets of its medieval old town and photograph it. However, not just ordinary amateur photography, but professional photography which participants can learn on a guided Šibenik photo tour. No special equipment is needed, just an ordinary camera or mobile phone will do. 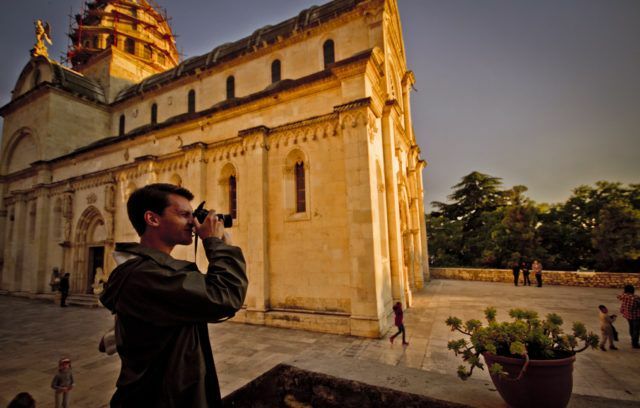 What makes this tour special are the two guides at visitors’ disposal; a tour guide who knows all the treasures and secrets of beautiful Šibenik – which boasts two UNESCO World Heritage monuments, and a photo guide who is a professional photographer. Šibenik is often called a cultural diamond. The tour guide shows participants all the best parts of the city whilst the photo guide teaches them how to capture the best shots and take professional photos. An additional special highlight of a tour is the photo album that participants receive at the end of the tour as a souvenir containing photos of them taken during their tour. The photo tour leads through narrow stone streets and passages, past churches and palaces, and allows for countless opportunities to get some great snaps. Participants walk the length and breadth of the old town centre passing the famous, as well as the hidden parts of the charming city. The tour includes visits to sacral buildings, monasteries, small diners that tell a gastronomic story of Šibenik’s past, and the UNESCO-listed St.James Cathedral (Katedrala Sv.Jakova), while the climax is the imposing St.Michael’s Fortress (Tvrđava Sv.Mihovila) from where there are panoramic views over the town as well as over St.Anthony’s Channel (Kanal Sv.Ante), the Kornati National Park with its hundreds of islands, and the Šibenik archipelago. To make the experience even more authentic and true to Šibenik’s character, the guides enhance the tour with stories about the real Šibenik, its hidden treasures, its people, customs, tradition and historical stories that are embedded in the city’s heart. In order to get even closer to Šibenik’s soul, the creative photo tours also include a break to taste traditional local food, prepared and served in the authentic Šibenik way. This tour, titled “Šibenik, you are beautiful” and organised by Šibenik Plus, can be offered to congress delegates seeking an experience full of adventure, beautiful images, hidden passages, aromas and tastes of the real Šibenik.